Tiny Somaliland, an unrecognized country in the Horn of Africa, has 3.5 million people, 53,000 square miles and runaway hyperinflation. 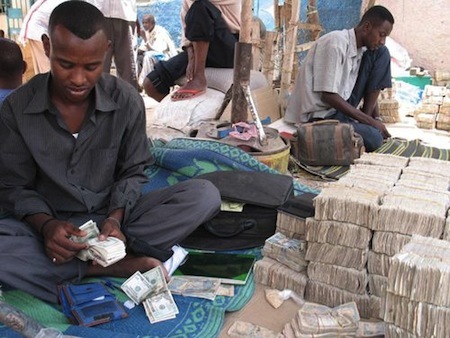 Take a look at this picture of some money changers with their bricks of cash. The diaspora will continue to wire money home but the recipients will no longer need to go to a bank or visit the money-changers. Learn about more ways to pay with your cellphone. Via Techcrunch.